When a third grader from a rural community told me that eggs came from cows because they were next to the dairy items in the grocery store, I knew it was the agricultural community’s job to step up and start educating the people that matter to food producers the most: consumers. This is was also the moment when I realized the huge opportunity I have to connect with consumers who earn to be connected with where their food comes from. So then, Oak Barn Beef was born. I am Hannah Esch, a junior Animal Science major at the University of Nebraska-Lincoln. This past year I had the honor of being the Nebraska Cattlewomen’s Beef Ambassador, in which I had multiple opportunities to speak to the youth of Nebraska. After the previously stated comment about “cow eggs” (not those ones!) and many more similar conversations with the youth of Nebraska, I decided it was time to bring a “face to the farmer.” I have found a true passion in the beef industry and want to share that passion and knowledge with people who were not given the same opportunity as me to grow up with the big, intricate creatures called cattle. 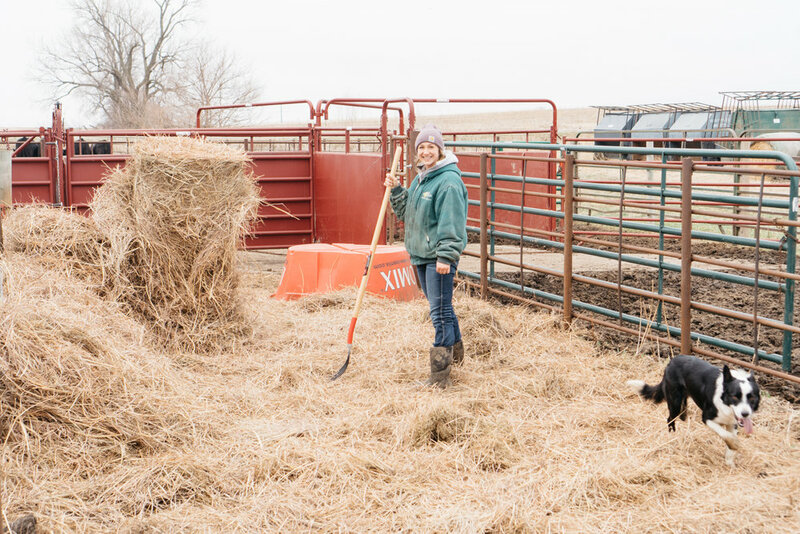 To share this passion, I started selling my family’s beef in the Omaha and Lincoln area with the help of my dad, and I recently began selling on a national level with a shipping option available to clients. By being given the chance to talk to consumers directly when delivering the beef, through social media, or blog posts, I’ve been allowed to tell the story of our family’s farm and answer common questions about beef that a lot of people have a hard time finding answers to: What is the difference between grass-fed and grain-fed beef? Why does the beef industry use antibiotics? How is animal welfare in the beef industry? Our Facebook and Instagram Page have also allowed me to show snippets of what we do in our day to day operations in owning cattle. While we focus on teaching about the beef industry, we take no shortcuts in ensuring the high quality taste of our beef. From the day the calf is born, they do not leave our care. Our herd grows up in green pastures with plenty of room to kick up their heels, and we transition the cattle to a corn-fed diet after they have reached adolescence. This helps sustain the environment and substantially improve the taste and tenderness of our beef. Another step we take in ensuring high quality beef is something we take a lot of pride in. With the help of a local DNA Testing Company, Neogen, we DNA test all of our cattle when selecting which calves to transition into our feeding program. The DNA tests determine which cattle we select based on their tenderness gene scores, marbling scores, and average daily gain. I wasn’t a strong believer in this program until we did a taste test between a steer that rated a 2 on tenderness and a steer rating a 9. The quality of beef was tremendously different even though the steers’ conditions were the exact same. The Neogen DNA Test plays a huge part in what makes our beef so dang good. We have also sought the help of a small-town butcher to hand-cut and 21-day dry age our whole beef. This lucrative process requires a high performing cut of meat; Only 10% of beef in the U.S. undergoes dry-aging. Over the 17-21 day process, patience is required to obtain the extraordinarily tender and tasty steak. Usually, you find dry-aged beef at a high end steakhouse, but we can put it on your kitchen table! As you can tell, we really have one priority: YOU. Whether it is putting a dang tasty steak on your dinner table or telling our family’s farm story, we want to serve you and your family. So please, like our page to hear our story and if interested in beef, check out our website.